I have owned an Urban Disguise 50 (Version 2.0) camera bag for two years now and have never done a review of it. Frankly, I own far too many camera bags, particularly from Think Tank Photo, so much so that I’m afraid my camera friends will begin to call me Imelda. But as I’ve gotten older I find that the right bag can prevent many of the aches and pains that we older photographers are prone to get. Those who follow my reviews know that I do not cover the technical details such as measurements, materials and speed ratings, unless those items directly pertain to how the item works in the field. Those stats are commonly available online at lab review sites or at the manufacturer’s site. What I do is review items I buy and use as a pro out in the field. The UD 50 is a terrific bag for its intended use, which is to carry photo equipment around with you while touring in a city or town. It is not intended for landscape or wildlife photographers and, as I’ll explain later, for extended use even in cities, at least in my opinion. The bag is extremely rugged and, as with all Think Tank products, very thoughtfully designed for serious amateurs and pros. At $199.75 it cost more than most bags because of those characteristics. Every stitch is durable. An abundance of pockets makes organization a cinch. The provided over-the-shoulder strap is padded and quite comfortable. An optional shoulder harness is available, but please see my comments below before purchasing it. The bag has plenty of room for a 15” laptop and a couple of file folders. I use a MacBook Air and it slips in and out with ease. It also has a zip-open expander, which I frankly find less than useful because it makes the bag a bit lopsided. The bag is perfect for using for flying, especially on foreign carriers like RyanAir, which are quite strict regarding measurements and weight. The bag complies with most carry-on restrictions in terms of size. The weight limitation is a practical one. It would be difficult to carry more than 10 Kg (22 pounds) and still be able to get around comfortably. The bag also has a zippered pocket in the back that allows it to mount easily on the handle of your luggage. When you’re done, zip the bottom and you have another handy pocket to drop in your boarding passes as you trudge through the airport. Other pluses include the thoughtful little things that Think Tank does. One is that the zippers work wonderfully and have a large hole drilled into the tabs so that the bag can be locked with a small lock. I carry another wire lock in one of the side pockets of the bag that allows me to attach to the bag’s zippers and the other side to an airport bench, hotel room bathtub bar, or restaurant table. Another plus are the two smaller expandable side pockets which hold a small water bottle or sundry accessory items that we photographers collect. 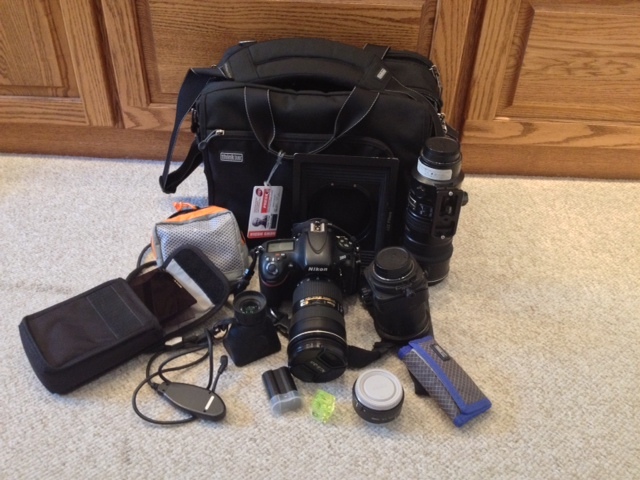 Here is a photo of the gear I packed in the UD50 to take with me for a one-month photo tour of Italy, Sicily and Malta. For the record, the gear includes a Nikon D800 with attached Nikkor 24-70 f2.8, Nikkor 70-200 f2.8, Nikkor 24mm tilt-shift, Nikkor 1.4 tele-extender, Hoodman loupe, 5 Lee/Singh-Ray 4x6 filters in case, Lee large filter holder, batteries, and paraphernalia. In addition, I carried my 15” MacBook Air in the purpose-built laptop compartment, along with its charger. I also devised a rig that allowed me to securely tie my 4-pound (1.8kg) travel tripod (see upcoming review on that) to the top of the bag. 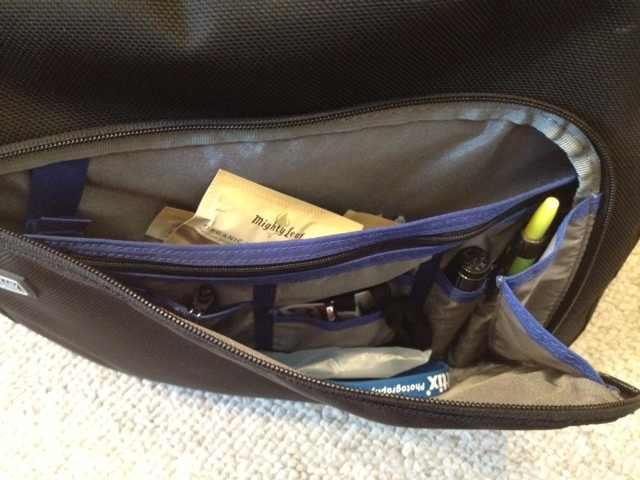 In this front pouch I carry lots of travel accessories, including pens, my stash of teas, business cards, earbuds, etc. I’m not sure whether the bag fools anyone into thinking this is not chock full of camera equipment (as in “Urban Disguise”), but the bag does well with one body and 2-3 lenses, filters and accessories. My biggest issue with the UD50 is that when fully loaded it is heavy and causes major neck pain for me if carried for prolonged periods of time. In fairness, I am over 60 and for a younger photographer that may not pose a problem. You can purchase an optional backpack harness that allows you to carry it on your shoulders as a hiking backpack. I did this for the entire month, as I hiked through cities, towns, villages and farmlands. All I can say is that while it is somewhat of an improvement over the shoulder strap, by the end of the first day my shoulders and neck were killing me and continued to do so for the duration of the trip. The harness is only meant for short-distance use. It does not fall on the hips for support, as a true backpack should. It also does not allow for the many useful adjustments that allow a pack to stay high and close to your body. Still, I would recommend the harness if you have no choice but to use the UD50 for lengthy city shoots. Despite its limitations, I like the UD50 and will continue to use it for weekend trips to cities or special assignments.